No matter the context, developing young leaders takes a certain degree of intentionality. You need a strategy, otherwise your hope of growing “tomorrow’s leaders” isn’t going to come to fruition. The demands of the workday will almost always take precedence unless you take the time to formulate a plan. It’s been said that there’s no such thing as bad teams — only bad leaders. Put another way, a company is only going to be as successful as their leaders are capable. Even for larger entities and corporations, it’s vital to establish a process of developing leadership in order to make sure the company will stay successful for years to come. You need to instill a passion and enthusiasm in young workers to create a culture that people are excited about. This positive, upbeat culture starts from the top down; if your management doesn’t buy in, your laborers certainly aren’t going to either! Today’s blog, as you likely already gleaned, is about how you can go about developing young leaders at your place of business. While a lot of the tips we provide will transcend the workplace, we are hopeful you’ll be able to use them whatever your context might be. But before we dive in, we thought we might give you a bit of context about where we are coming from at TreeRunner Raleigh Adventure Park! We are so thrilled to offer one of only a few aerial adventure parks in the nation. Originating from Europe, treetop adventure park feature obstacles, zip-lines, and rope courses — all high above the ground among the trees! At our TreeRunner Raleigh Adventure Park, we have over 70 obstacles and zip-lines, seven courses, plus a Junior park for kiddos ages 4 to 7! With three different difficulty levels for folks of all abilities, pretty much everyone in your group or family will be able to enjoy themselves while experiencing a unique challenge at the same time! 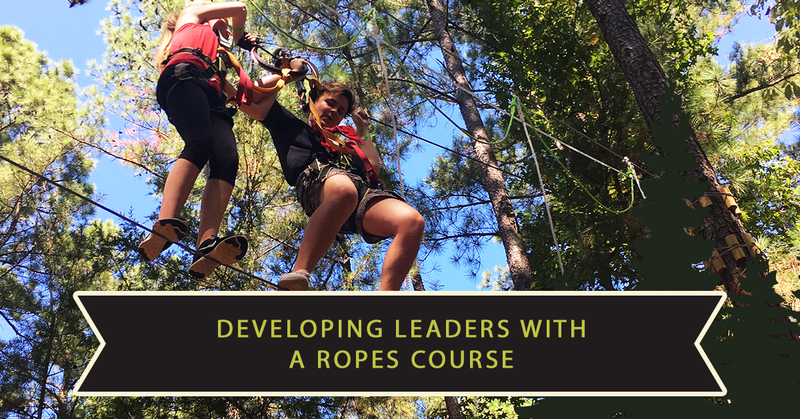 Now that we’ve established the fact that we offer a Raleigh adventure unlike any other, let’s talk about developing leaders, and how our high ropes course just might play a role! Confidence is a funny, fickle thing, isn’t it? One day you have it and feel virtually unbreakable, and the next the most mundane of obstacles might make you feel like throwing in the towel and waving the white flag. And while everyone is different in terms of their self-esteem and efficacy, a sure-fire way of ensuring that you don’t develop young leaders is by not empowering them with the confidence they need to start, well, leading. If you have particularly young leaders, in the sense that their workforce is noticeably senior to them, one of the biggest obstacles they will face is not feeling empowered to lead those who are older than them. That’s a problem, because they are, you know, in charge! That’s why it’s so important that you give your leaders the authority to handle situations according to their best judgment (obviously, according to your company’s standards). This can be done through reinforcement of commendable behavior, award ceremonies to recognize achievement, and in other ways specific to your own corporation. The above point leads nicely into this one — one of the best ways you can develop young leaders is by practicing what you preach. Don’t just set a solid example 99 percent of the time; do it all the time. Whether you are dealing with young professionals in the workplace, a youth baseball team, or your own kids — the point is that young people will quickly pick up on what they can and cannot get away with. Obviously, you want your employees to be setting an example for new staff on their own. But again, this kind of thing starts from the top. Another key to developing young leaders in the business world is through empowering them to be autonomous in terms of their decision making. This starts with you, assuming you are their superior of some sort. It starts with your decided effort to not micromanage. This can be difficult to avoid, especially when you have a strong desire to see your young people do well. But you have to be willing to let them make their own decisions, even if that means letting them make their own mistakes from time to time! Learning lessons “the hard way” might not be pleasant for anyone, but hard lessons often make the best teachers. If you want your young talent to stick around and develop into world-class leaders, you have to make it worth their while. Most of them, if they are indeed talented, will have some degree of sense that they are special. That means they might get the urge to check out just how green the grass is on the other side of the fence — if you aren’t making sure they feel loved and valued. If you are in the Durham and Raleigh vicinity, we strongly encourage you to check out our local adventure park, high among the trees. We described what it has to offer already in today’s blog, but we’d like to emphasize the fact that so many groups come to our ropes course to have an amazing time enjoying our team-building activities. 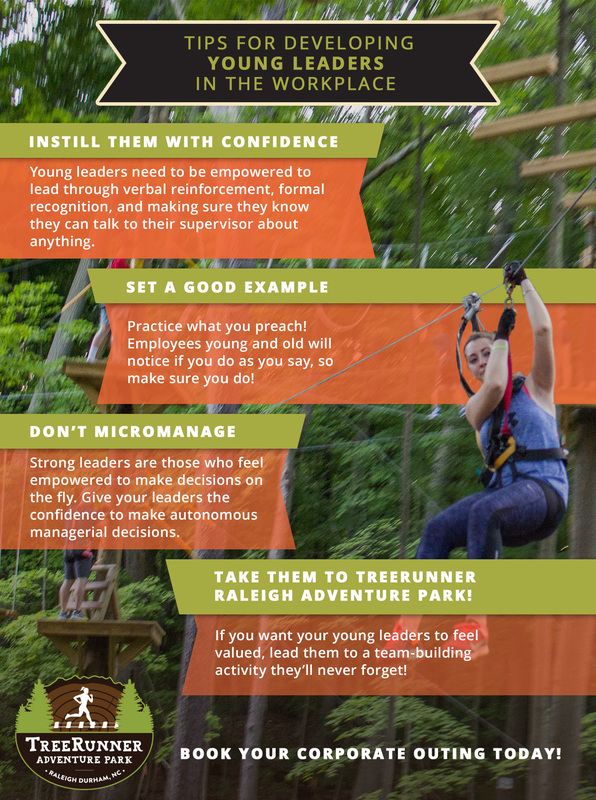 If you’ve been looking for a way to show you care, we can think of nothing better than a corporate outing with the TreeRunner Raleigh Adventure Park at the center of things. And sure, we might be biased, but that doesn’t mean we are wrong! Not only will your group understand how much you value them, but they’ll be developing leadership qualities while they are having fun high up in the trees! Learn more about our team-building options right here. We hope you’ve enjoyed today’s blog as much as we did while writing it! Incorporate a few of these tips into developing your leaders (especially the last one), and you’ll be well on your way! Book your aerial adventure in Raleigh, today!